It's an astonishing sight. 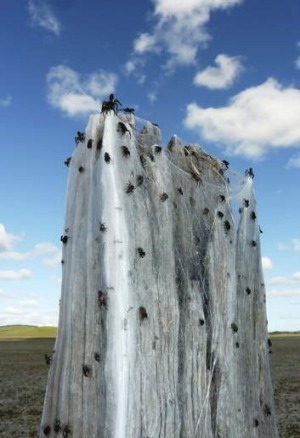 An intricately spun mat of cobweb coats the vast expanses of the otherwise desolate lake bed. Even wooden fenceposts, which stretch across the cracked mud for as far as the eye can see, have been tightly wrapped in the weird white web. It's as if we've stumbled upon the secret outdoor workshop of environmental artist Christo (who once draped Sydney's Little Bay in white sheets); either that or a sci-fi movie set. Occasionally, the gentle nor-easter sets a silky thread or two free and it floats, trance-like, until, triffid-like it wraps itself around whatever blocks its way. Surrounded by a landscape virtually devoid of any vegetation more than a few centimetres in height, it's little wonder that we have to keep plucking cobweb out of our hair. 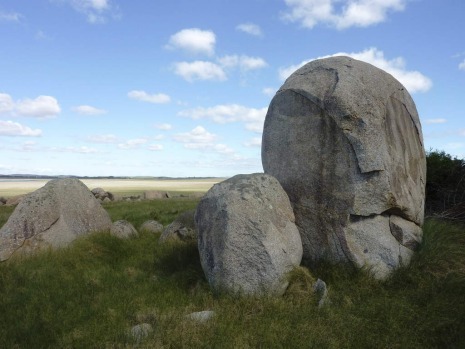 We are trekking across Lake Bathurst, its flat bed punctuated only by occasional outcrops of granite boulders which sit haphazardly among pools of oozing mud. While the mysterious waters of Lake George are well known, this smaller and lesser-known lake, just 30 kilometres to the north-east of its bigger neighbour, casts a similar spell over those few lucky enough to tread its shoreline. 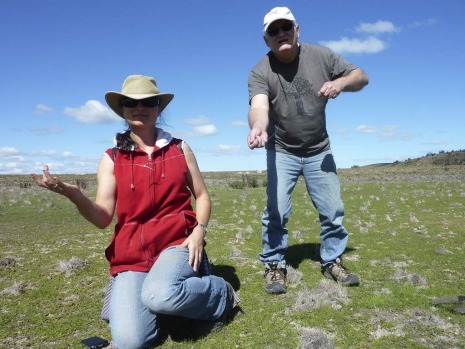 Unlike Lake George, which is fed by several creeks, no significant watercourses flow into Lake Bathurst, so it's totally reliant upon local rainfall for its inflow. But it's not the lake's unusual hydrology that has lured your Akubra-clad columnist here, rather something related to my infatuation with cryptozoology - for it was here that the first bunyip report by a European was made when, in November 1821, settler Edward Hall claimed he had seen an ''extraordinary creature'' in the lake. In a letter to the Sydney Gazette on March 27, 1823, Hall reported that, "it was 100 yards away … and the appearance of a bull-dog's head, but perfectly black". Apparently Hall's overseer shot it one morning with a heavily loaded musket, and before it recovered enough to escape he estimated its length as about 5 feet [1.5 metres] long. Now, with most cryptozoological critters, whether it be the Loch Ness Monster, Bigfoot or even the bunyip, the biggest challenge is collecting some (or any!) sort of physical evidence. Just three years prior to Hall's sighting, explorers Hamilton Hume and James Meehan apparently found bones here that they believed belonged to ''a large amphibious animal''. The two explorers didn't take the bones back to Sydney, and despite a subsequent offer by the Philosophical Society of Australasia to pay for Hume to return to the lake, he never did. In fact, the bones were never recovered and I'm on a mission to find them. 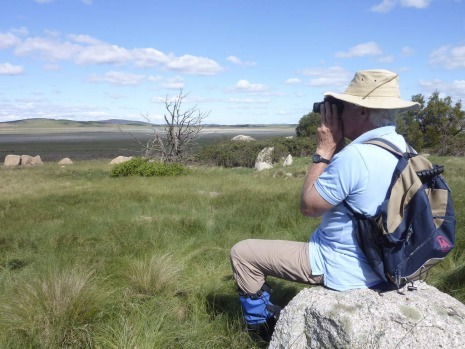 As the lake bed is privately leased, it's difficult to access, but I've managed to score a spot with the Goulburn Field Naturalists Society, which has permission for a field trip to document the flora and fauna. Now, while I'm genuinely interested in catching a glimpse of the large patches of the restricted fan-flower mudwort (Selliera radicans) and to photograph the only known population of salt lawrencia (Lawrencia spicata) in NSW (let's face it, what naturalist wouldn't be? 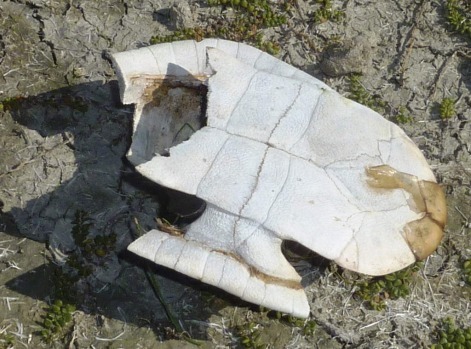 ), such close rare-flora encounters pale into insignificance when compared with the prospect of recovering the country's most fabled bunyip bone. Heck, apart from bringing in a live Tasmanian tiger, it's just about the Holy Grail for any Australian cryptozoologist worth their mettle. Not surprisingly, it's not long until some of the Goulburn gang start to suspect I have an ulterior motive. While they crouch down on all fours and pull out their magnifying glasses to examine the leaf structure of an attractive orange ground cover, the Tasmanian dodder (Cuscuta tasmanica), I slink off to check out what appears to be part of a skull with two horn-like protrusions sticking out of the mud. My heart thumps. It couldn't be, could it? 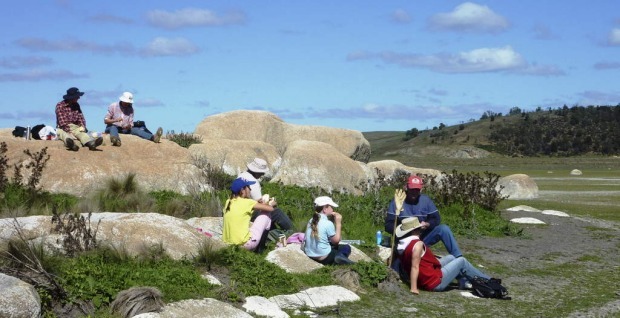 All this bunyip hunting works up a hunger and lunch is scoffed while we sit perched on a rocky outcrop. The morning's tally is a good one for the field naturalists, with most of the rare plant species ticked off their list. A highlight for many was seeing an Omeo storksbill (Pelargonium sp. (G.W. Carr 10345)), an endangered plant with only four known populations in Australia, in flower. Our expedition leader, Rainer Rehwinkel, a senior threatened-species officer with the NSW Office of Environment and Heritage, reveals that he has secured funding through the NSW government's new Saving Our Species program to fence off populations and undertake weed control around this rare Lake Bathurst population. "One fence has been erected and weed control will commence next spring," Rainer says. While everyone else dines out on their morning successes, all I've turned up are two sheep skulls, a kangaroo femur and three eastern long-necked turtle carapaces. 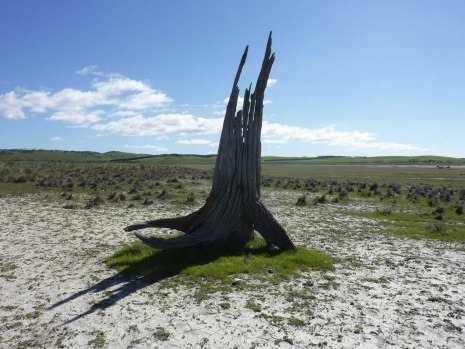 Thankfully, not all the lake's vegetation is best viewed with a magnifying glass - although the lake bed is treeless, apart from a striking stump near the southern shore that resembles a giant snail with its antennae probing the air, there are some trees on the lake's main island, Rabbit Island, our next port of call. After a good growing season it's not easy going and at least twice, I fall somewhat clumsily into old wombat burrows, hidden by curly sedge (Carex bichenoviana), a really soft native grass. Although only a few metres higher than the surrounding lake bed, the island provides a perfect vantage point to spy on the birdlife. This is a twitcher's delight, with rarities like the freckled duck, pink-eared duck, Australian shelduck, and also black swans all on show. So while the others swap their magnifying glasses for binoculars, I do my (now) usual disappearing act, where I stumble upon a rather imposing granite rock staring back at me that bears an uncanny resemblance to an Easter Island statue. I bet it knows where the bones are. It's late afternoon and brooding storm clouds gather ominously on the horizon. The wind also picks up and the single strand of wire tightly wound through another line of rickety fenceposts begins to sing an unnerving tune. Maybe it's summonsing the spirit of the bunyip? Although I didn't bag Hume's long-lost bone, I return all the wiser for having traipsed over this rarely explored natural treasure. Keep up the important conservation work Rainer, and hopefully the good folk at the Goulburn Field Naturalists will give my membership application due consideration at their next meeting. They could do with a cryptozoologist. Actually they'd probably also be keen to sign up an arachnologist, for no one on the field trip was able to identify the spiders, let along explain their extraordinary web-weaving effort. Don't miss: Next week's column, for part two in my expose on Lake Bathurst, which will reveal how it once was home to Australia's largest sailing club outside of Sydney Harbour (really!) as well as its clandestine connection to World War II. 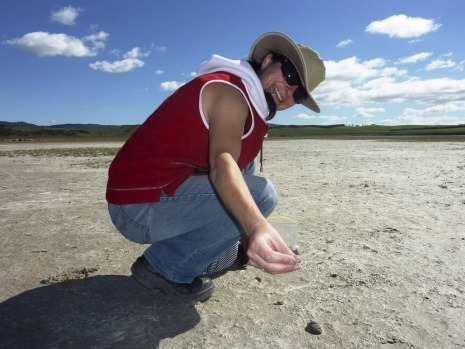 Lake Bathurst: Located about 60 kilometres north-east of Canberra between the villages of Lake Bathurst and Tarago, it fluctuates in size from a few puddles to up to 10 square kilometres in area when full. There is currently no public access to the lake. Did you know? The lake is named after Earl Bathurst who was secretary of state for the colonies (1819). Its Aboriginal name is Bundong. Piscatorial paradise? Not exactly - clay flocculation and extensive plant growth in the lake aren't conducive to supporting fish life. Email: timtheyowieman@bigpond.com or Twitter: @TimYowie or write to me c/o The Canberra Times, 9 Pirie Street, Fyshwick.